Anytime you want an unforgettable treat that's as delicious as it is good for you, reach for a Ruby Red Grapefruit. Their world-famous taste is unforgettable. Hand-picked at perfection's flavor peak, our Florida Ruby Red Grapefruit arrive ripe and ready to enjoy! Florida Ruby Red Grapefruit are sweet, extremely juicy and rich in flavor. They are great for fresh eating or fresh grapefruit juice and never need sugar. Prefer Mixed Oranges and Grapefruit? At the "Pack With:" box select "Mixed Oranges and Grapefruit." We will include our finest oranges in season. Sign up to be notified when Ruby Red Grapefruit is in season. Florida Ruby Red Grapefruit are available November through April. Known to be high in Vitamin C, grapefruit, including Florida Ruby Red Grapefruit, also contain many other vitamins and minerals thought to help lower blood pressure and cholesterol, fight anemia, help prevent cancer and provide other health benefits. Florida Ruby Red Grapefruit may interact with some drugs, including cholesterol and blood pressure medications. It is recommended that you consult your doctor or pharmacist if you are concerned about the interaction between grapefruit and medications that you are taking. Florida Ruby Red Grapefruit, initially called "Redblush," was a "limb sport," or spontaneous mutation of a Thompson Grapefruit, itself a sport of the Florida White Marsh Grapefruit. Redblush was first observed by J. B. Webb of Donna, Texas in 1931. Budwood from the limb was grafted onto rough lemon root stock and in 1934 this generally seedless red grapefruit was widely introduced. 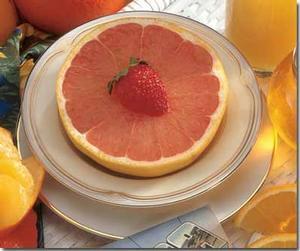 The warm, moist climate in Florida fostered a particularly juicy and sweet fruit which was renamed Ruby Red Grapefruit and now comprises the bulk of the state's grapefruit crop.